So the first set of MOTHER 1 and MOTHER 2 figures has been released, and some have started to hit eBay. Already from the start the asking prices are very high, at $100 for each of the MOTHER 1 ones. It seems like there’s always price gouging when it comes to this series’ merchandise, so it’s not too surprising. Still, I’m curious to know what fans would consider reasonable prices for these figures. Is $50 better? Or would that still be too high? $25? 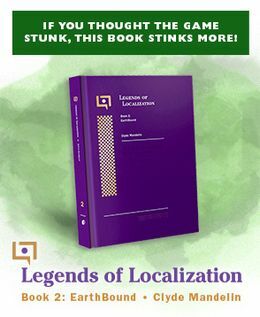 Keeping in mind that they do cost a lot of money to win and that import costs add up quickly, of course. I’ve posted a poll about this, so click here to vote! POLL: What would you consider a reasonable price for one of these new MOTHER 1 / MOTHER 2 figures? If the quality was good on them, I’d be willing to consider something right around $50, and maybe a bit over. Much higher than that and I’d start looking at getting more bang for my buck with some of the very high-quality toys and statues (of comic book and cartoon characters mostly) that can be found in comic shops and places that specialize in anime/manga merch. Ninji: Maybe, but people are still trying to sell those giant Mr. Saturns for insane prices. I think $50 shipped is a fair price for these. That’s what I’ll end up paying for my set all said and done. At the time of this post there is someone on eBay asking $330 shipped for a set of five and that’s the closest I’ve seen to fair pricing stateside. I will be waiting patiently on the next wave instead of jumping in like a fool 😀 I think the minis are going to be cheap when it’s all said and done because, even though nicely detailed, they are quite tiny. I paid about $200 for my full set after all the fees are calculated in. I could have held out and got it for quite a bit less. I’ll be biding my time next round when the M2 figures are out. Fair is the price a willing seller meets a willing buyer. I’d say they’re worth something in the $25 or less range. They’re really just cheap, molded plastic pieces that snap together; nothing spectacular. The detail isn’t quite as nice as the original models, but they’re still must-have collectibles for fans. I won’t pass up the chance to collect them all. I could not bring myself to pay any of the outrageous prices of the current eBay auctions. Even with all the fees associated with importing them with a bidding service, it’s still much cheaper to go through Yahoo! Japan. The prices there are gradually decreasing. Buy it Now prices range from 1500 to 5000yen. I think if you’re persistent enough, you’ll find some great bargains. Its hard to say what is a fair price,i never have much extra cash to decide with,as far as I’m concerned $10 is as high as I’ll go for a toy honostly. I’d pay right around $40-$50 shipped for these, I don’t think I could bring myself to pay any more for them. I hope the prices will come down to that range on eBay soon, I really want a few of these for my collection. I would definitely pay $50 for some Mother 2 figures. Less than $25. Anybody who says otherwise is either Bill Gates or an obsessive idiot. 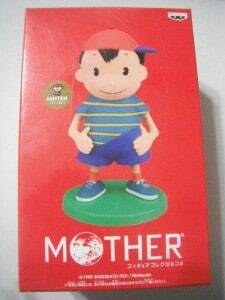 Something I’ve always wondered about Ninten is, why….is part of his shirt missing (or just…stop, whichever), and reveals what appear to be rather pulled-up shorts? I was a bit shocked when I saw the ebay prices. I honestly was hoping I could get one for about $30. Shirworwolf – I believe his shirt is supposed to be tucked in a bit on one side and not the other. Maybe they thought American kids were sloppy. 😛 Ness’ shirt is actually like that too, but not as much and more realistic looking. Yeah, I was hoping for the prices to be in the standard semi-rare-but-still-in-circulation range of $30-50 per figure. If they were selling these instead of putting them in ufo catcher machines, they’d make a killing. I really fail to understand the logic behind making such obscure merchandise so limited… Your target audience is not that gigantic to begin with, why limit the chances of income? How much does a go at the claw machine cost? 100 yen? Jeez… per pop? I don’t know if I could really part with more than $25 for each. I paid $300 for my set. I actually said $100+. The way I see it, these figures are some of the best and most unique EB merchandise officially released. In the years to come, every Mother fan/collector will want these over the majority of other merch. I’m not sure how many will be released, but I’m confident they will retain their market value and demand. Well, I guess I’ll put my money elsewhere. I’m not touching anything more expensive than the game itself ! I’d spend $25 on a Loid, But $100 on a Ninten. These are 5 inch figures… I wouldn’t pay more than $25 for the whole set. I mean come on they are pieces of plastic that more than likely cost less that a $1 to make. If they are super rare I can understand the price hike. But, I am more than happy just to play my Earthbound cart than spend 1/4 of my pay check for 1 figure. I’d probably find $15-20 per figure reasonable, plus whatever shipping from Japan costs, though they’d probably cost a bit more (or a lot more for a whole set) since they’re just coming out. There’s some around 50$ now on eBay. I said $25-$50. Per figure, that seems worth it. But I really hate eBay because they overprice ANYTHING that’s considered rare. I don’t get why Banpresto didn’t release these in America and Europe. Because you have no idea how much I want a Ness figure right now.